This school began as a spontaneous child-minding service in the informal settlement section of Olievenhoutbosch. 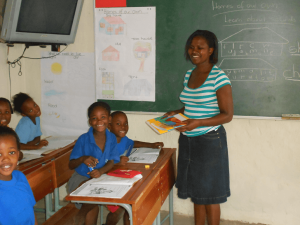 It has grown into an efficient and well run school which now hosts 127 pupils ranging from Grade 0 through to Grade 4. The school also hosts an aftercare facility and on Wednesday’s this is open to the whole community. The aftercare children are provided with a meal in order to ensure that some fundamental form of nutritional input is obtained. The school is nestled against the ruins of an old tobacco warehouse and is composed predominantly of wooden wendy houses with the odd converted shipping container. Current challenges are registration with the Department of Education, finalisation of the land usage rights and further development for the teaching staff over and above the expected financial needs.Ria Wessels is the principal and does an excellent job in both teaching the remedial class and managing the school.